The Theewaterskloof Dam, which supplies most of Cape Town’s potable water, in February 2018. With the summer dry season underway, dams that serve the city stood at 63.1% of capacity as of Monday, up from 28.8% a year ago, according to the city’s weekly assessment, which Limberg notes is based on the city’s own determination of water use from the provincial supply and can vary from estimates published by the national government. But while Cape Town delayed Day Zero, stresses on the city’s water supply and throughout South Africa remain. According to a report published last March by the Institute for Security Studies, the challenges include a growing population, contamination of rivers, leakage from rickety infrastructure (including wastewater treatment facilities in disrepair), and dependence on coal, which provides roughly 77% of the country’s energy needs via power stations that need water to cool. 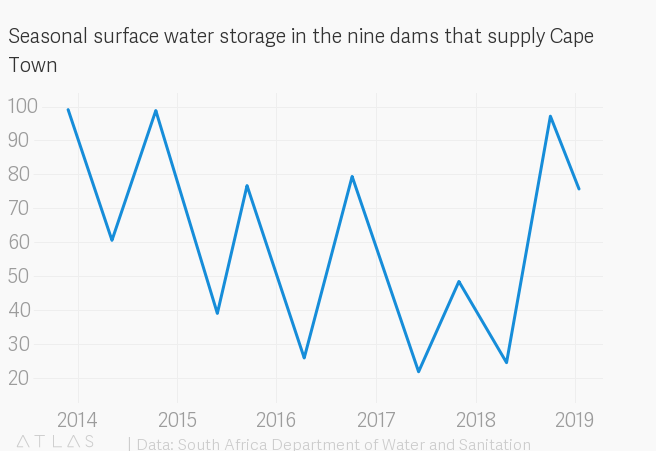 Compared with communities across South Africa, Cape Town, hailed as one of the world’s favorite tourist cities, can count on its clout to attract attention to its water woes. The number of international visitors to the city rose 9.6% last year despite the drought.